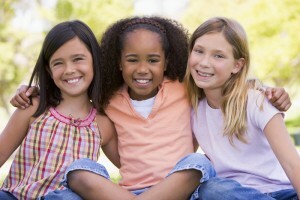 Although we can treat dental problems at any age, some developmental problems are best treated in two separate phases. That's why we follow the American of Association's recommendation that every child have an orthodontic evaluation at age seven. Two-phase treatment is a very specialized process designed for young children. Because they are growing rapidly, children benefit enormously from orthodontic appliances that modify the relationship between upper and lower jaws, balance the face and develop room for erupting teeth. This early intervention consists of a first phase of treatment when both permanent and baby teeth are present. Phase I treatment involves the patient's muscles and jaws more than the teeth, although some concerns regarding tooth positioning may be addressed. The goal of this first phase of treatment is to create the healthiest environment possible for the eruption of permanent teeth. It is not intended to eliminate all future orthodontic needs. By starting early, your child has the best chance for good results. When all conditions warrant beginning a second phase of treatment, a re-evaluation is done and the necessary remaining treatment is determined and a plan established. The second orthodontic phase involves correction of tooth position, space closure, and other refinements which are important to function and stability. If you have concerns about your child's dental development, call Bel Air Orthodontics at 410-838-2244 to schedule a complimentary initial examination with Dr. Stephen Godwin.